The Bank of England can control liquidity and money supply, so commercial banks need to borrow short-term money from the Bank of England. This means this repo rate is important for commercial banks. Therefore, if the Bank of England increases their repo rate, commercial banks tend to increase their interest rates too. 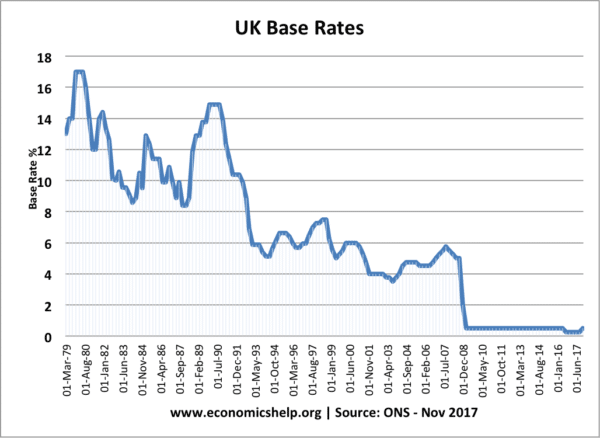 If inflation increases above the target (or is forecast to rise above the target) then the Bank of England are likely to increase interest rates. Wage rates – rising wages can cause both cost-push and demand-pull inflation. Commodity prices – rising oil prices may cause inflation. As well as trying to target inflation, the Bank of England considers other aspects of the economy. In particular, they need to consider the impact of monetary policy on economic growth and unemployment. 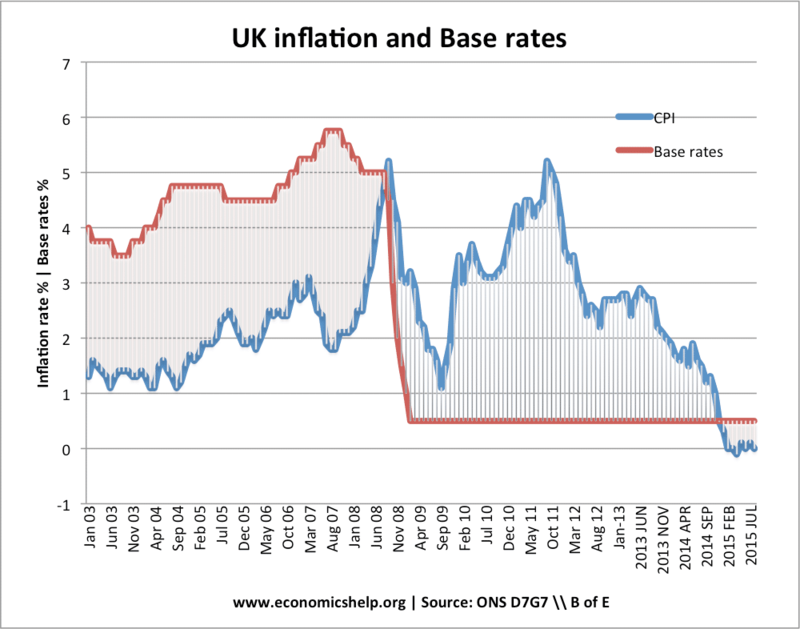 As we mentioned in different types of inflation, there are different measures of inflation. If CPI rises because of temporary factors like volatile energy prices or indirect taxes, this is likely to be less cause for concern. However, if inflation occurs because the economy is overheating and there is rampant wage inflation – this presents a stronger case for raising interest rates to moderate economic growth and prevent boom and busts. Impact on asset prices. Low-interest rates may cause a boom in bank lending and asset prices. In the ‘great moderation’ of the 2000s, inflation was low, but, there was a boom in bank lending and asset prices. Arguably the economy needed more than just relying on interest rates. It is because there are different account holders with different interests ranging from individuals,firms and governments.